This is the first of an intended annual open-submission exhibition at Tokarska, with part 2 due to follow in a couple of weeks. A wide range of works were on display by artists from near and far; from those with studios around the corner to those from overseas. A busy but coherent hang fitted over sixty works into the relatively small gallery, without it seeming crowded. My favourite works were Rush Hour at Twilight by Nick Pike (which surprised me as not my usual style of choice) and Recall and Record by Jemma Gunning. My heart sank when I turned up to the Hayward just after opening and realised that I would be sharing the gallery space with hundreds of children. The fact that I was told on my way in that there were ‘no photography and no running in the gallery’, didn’t help to reassure me. However, I decided to head upstairs rather than following the usual route, and managed to see almost everything in that half of the gallery completely alone – a highly recommended tactic! I’d seen works by a lot of the artists before and so knew what to expect, and in fact had braced myself to be disappointed. I’m happy to report that this did not come to pass, quite the contrary in fact, there was not one piece that I didn’t connect with and really appreciate. Model for a Timeless Garden by Olafur Eliasson features water from a range of fountains illuminated by a rapid strobe light. The effect is such that it is impossible to see the water moving, but instead the viewer is presented with an ever changing selection of beautiful glass-like sculptures created as droplets hang impossibly in mid-air in front of you. Carlos Cruz-Diez’s Chromosaturation immerses the audience in first blue, then red and green light. The effect is such that the colours are incredibly intense when you first step into a room, but then eyes adjust and what was once super-saturated red becomes shades of white and pink. Move around into the next room and you are almost overwhelmed by the intensity of the colour until your eyes again adjust. I was grinning like an idiot as I went from room to room repeatedly experiencing the effect, and listening to the reactions of other visitors as they did the same. I’m constantly impressed by the quality of exhibitions at the Hayward, and have never yet been disappointed. Do go, but be prepared to queue to get into see some of the pieces, unless like me you can employ some cunning gallery tactics. I spent an enjoyable hour or so in this small gallery that had literally popped up at one day’s notice on Cork Street ahead of an intended longer show in May. I really enjoyed Christopher’s work and found it very interesting talking to Laura from Full-Circle about his process, techniques and inspirations as well as the challenges of popping up a gallery at short notice. Having spent ages there talking to her and enjoying the work, the artist himself appeared just as I was leaving so I was able to talk to him about it as well. 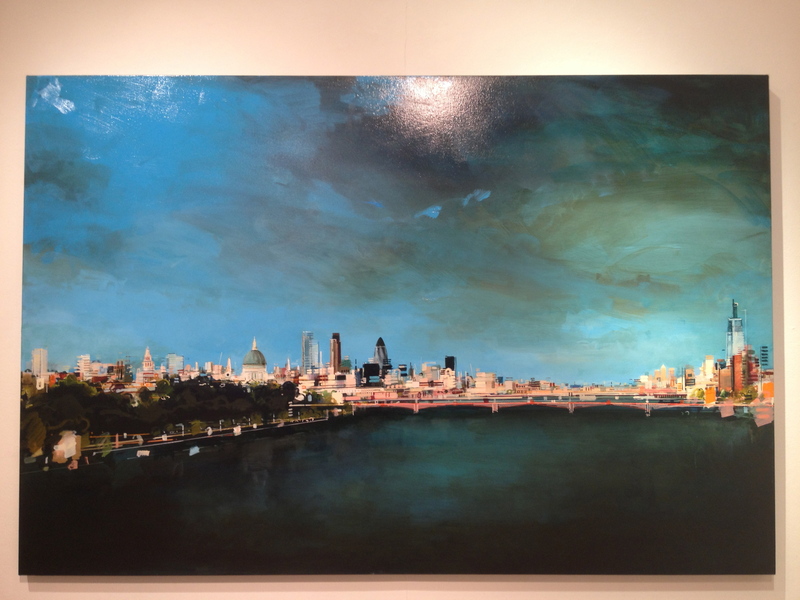 Farrel’s cityscapes are reminiscent of the work of Canaletto, but with a modern twist. His across the Thames particularly appealed to me and I got carried away for while with the thought of commissioning him to paint on from my particular favourite spot on Hungerford bridge. I’m looking forward to keeping up with Farrell’s work and visiting the larger exhibition later in the year.